Also called bottlebrush, mare's tail, scouring rush, and shave grass, horsetail (Equisetum arvense) is a perennial herb that contains bioavailable “silicon,” a trace mineral required by the body for flexible joints, glowing skin and stronger bones. Horsetail likes moist and sandy soil found in temperate climates in much of North America, as well as in similar climates in Europe and Asia. It's been around a long time—living for more than one hundred million years, once dominating the late Paleozoic forests. In spring, the stem resembles asparagus, which then withers and turns brown in early summer, giving way to green stems that are thin and look like the tail of a horse. This herb has long been used to cure a variety of ailments, once recommended by a Roman physician and mentioned in scriptures of Chinese traditional medicine. The Greek physician Claudius Galenus first recorded its use, and the seventeenth century English herbalist, Nicholas Culpepper, used it in a variety of treatments, including those for ulcers. Historically, horsetail was used internally as a diuretic, to increase blood circulation, infections, arthritis, and respiratory disorders. Native Americans and even today's campers have been known to use it to scrub cooking utensils. Inside the human body, silicon is important to the strength of the blood vessels, organs, skin, hair, and bones, contributing to the form, resilience, and flexibility of all connective tissues. Horsetail has so many benefits for skin we included it in our Anti-Aging Eye Cream, our Ayurvedic Facial Scrub, our Beauty Blend Tea, our Herbal Facial Oil for Normal and Combination Skin, and for Oily Skin. 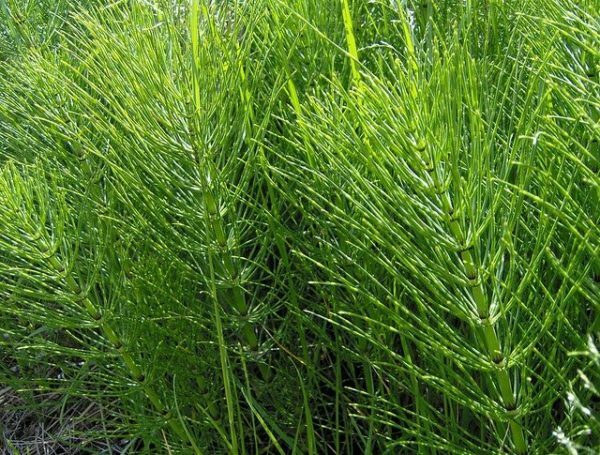 Have you tried horsetail for skin problems? Please share your experience. Photo courtesy Beedle Um Bum via Flickr.com. I decided to give it a try, I added horsetail tea to my black soap face wash. The results were amazing! In three days the rashes and black heads were gone, my face felt firmer and tighter without being dry. The texture of my skin is also smoother. Will definitely be trying horsetail infusion for my body oil. Horsetail is not a fern. Horsetail does have thiaminase which will destroy thiamin, vitamin B1. You should take extra thiamin, either by itself or in an additional multi vitamin. Horsetail will also increase your blood pressure by 6 -10 units. You should reduce or dilute its concentration. It will improve your nails, etc. It’s really reassuring to hear that horsetail extract didn’t have any adverse effect on you/your daughter. I completely agree with you in regard to man made medicines which we openly accept today whilst disregarding natural means to cures. It’s a great irony the tweaked/processed/manufactured versions of what nature has provided is acceptable for people whilst the pure thing is feared or rebuked or the very least sceptical…. It’s a very sad reality. Nevertheless what I was most interested, could you please elaborate on the herbs you have used so far and your experience? I would highly appreciate your input! My daughter fractured her arm when she was 2 years old. She didn’t complain of pain or cry, and I would have never even known she had broke her arm, if it weren’t for a strange looking bump that had developed, which made her uncomfortable when I pressed on it. I took her in, they x-rayed her, and put a cast on it. The entire time the cast was on, which I cannot now remember, as it has been 14 years since, I had her drink powdered horsetail in a smoothie. When she went back to get her cast off, she received another x-ray and the doctors where amazed at how well it had healed, considering the type of fracture it was, and her age which meant she was still in constant motion and not taking it easy, resting, or staying still. As I said above, this was 14 years ago. My daughter is bright, and rarely gets sick, and she does not have any cancer. While taking herbs as medicine may scare some, it is important to remember that these medicines which are part of the natural world are one’s we have evolved along side of. This cannot be said for modern medicine, and while modern medicine has its place, I myself am much more afraid of the chemical constituents in modern medicine which are not tested long enough in trail studies that I could ever be of plant medicines. Plants which have a long history of use should be seen as medicine. There may be a volatile property or two contained in such plants, but often the plant also has those properties exact balance which make them harmless or inert. These volatile properties are not pure extracts, they are a part of a synergetic complex. I took herbs all through my pregnancy with my daughter as well, had a homebirth, and took herbs during labor, and for healing and lactation after her birth. We are fine and have never had any health problems from any of the herbs we have used which all have a long and powerful history of use for such things. I hope this helps your fear. I have been drinking horsetail tea regularly for only a few months but have noticed a remarkable difference in the strength of my nails, and firmness in my skin. This has been most exceptionally noticeable on the back on my thighs where cellulite has increased over the years. Where can I buy horsetail juice?